NYS Thruway I-90/I-87 to Exit 24 (Albany). Follow to Adirondack Northway (I-87) to Exit 22 (Lake George Village). Turn Right on to US Route 9. Drive 2 blocks to Marine Village Resort. Take the Adirondack Northway (I-87) to Exit 22 Lake George Village). Turn Right on to Route 9. Drive 2 blocks to Marine Village. 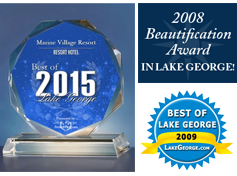 Marine Village Resort is located at 370 Canada Street Lake George, NY 12845. Sign up for Email News and Specials!